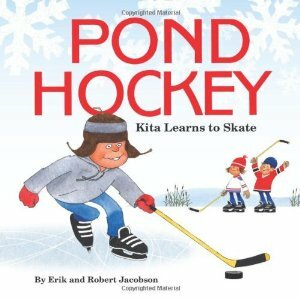 Erik and Robert Jacobson present their cute 40 page book Pond Hockey: Kita Learns to Skate . The book is aimed at readers aged 3 through 8. Little Kita can't wait to play ice hockey. But first he must learn to skate. His brother Bobby shows him how by demonstrating the correct movements. Kita practices hard and learns fast. Soon he's ready to play pond hockey with his big brother and new friend, Allie. What could be more fun than that? The book is nicely illustrated, certain to capture the imaginations of youngsters. The story is a simple and fun quick read, teaching good lessons and friendship and sportsmanship. If you know a youngster who is about to learn to skate or to start playing hockey, Pond Hockey: Kita Learns to Skate would be an ideal gift.